One of the biggest mistakes investors tend to make while planning for their retirement is looking at returns in isolation, said Prakash Lohana, Managing Director, Ascent Financial Solutions. 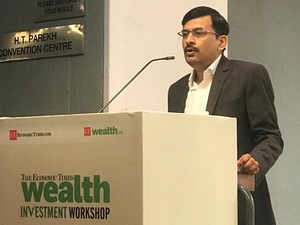 Comparing two investment options without considering the tax implication will give you a wrong picture, said Lohana at the ET Wealth Investment Workshop held in Ahmadabad on March 8. Lohana explained his point with an example of debt mutual funds and bank fixed deposits. On the face, both of these instruments offer around 7 per cent returns. However, once you include taxation of the two investment options into the frame, the entire picture changes, said Lohana. Take a look at the table below to understand how debt mutual fund, invested with more than three-year horizon, score big after tax with the help of indexation. Lohana said that retirement is one of the most important goals for investors and it should be the first goal that they should start to invest for. “Many investors believe in last minute investments for their retirement planning. Remember, the older you get, your retirement planning gets more difficult,” Lohana said. While answering questions by the participants at the ET Wealth Investment Workshop, Lohana said that there is no specific investment product that can suit everyone’s needs. Investors fall in different tax brackets which decide the suitability of the product for every investor. “We have different instruments to take care of retirement planning- mutual funds, bank deposits, Senior Citizen Savings Scheme, Post Office Schemes and Pension Schemes etc. All of them are suited to different type of investors,” says Prakash Lohana. Lohana also stressed on the increasing life expectancy and the challenge of funding the extra years. When you live longer you need more money to live without any financial instability and hence a better plan, says Lohana. “When you invest for long-term goals like retirement, indexation and compounding play a very important role in growing your corpus. You should make sure that you invest regularly and check that the tax isn’t eating into your retirement corpus,” Lohana said.